More French chefs here. Other Pastry chefs here. More female chefs here. Claire Heitzler creates refined, subtle and sensual desserts. She did her apprenticeship in retail patisserie where she acquired sound technical skills. 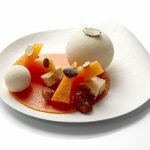 She started in restaurant patisserie at the Troisgros in Roanne, Georges Blanc First pastry chef position at the Amphitryon in Lorient. Claire began by undergoing general chef training. 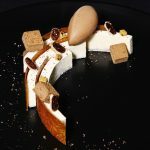 To perfect her skills, she joined the team at the prestigious “Troisgros” in Roanne, working as a commis patisserie chef. Next, she moved on to work with Georges Blanc in Vonnas, then Jean-Paul Abadie in Lorient. Her insatiable desire for exploration pushed her to discover new shores, and in 2003 she became the patisserie chef at l’Oranger, London. 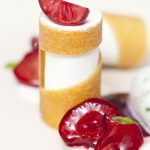 In 2004, she was contacted by Alain Ducasse with the offer of a new position – patisserie chef in his new restaurant Beige Alain Ducasse Tokyo in Japan. Her world tour continued through, when she moved to the Park Hyatt in Dubai. In 2009, she returned to Paris and undertook the position of patisserie chef in the legendary Ritz Hotel, working alongside Michel Roth. 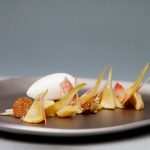 In 2010 she became the head patisserie chef at Lasserre. She draws her inspiration from selected seasonal produce. She aligns classical flavors with a lighter touch and her own unique creativity. 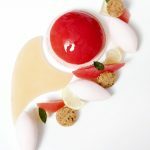 At Lasserre, Claire seeks to offer French-style desserts with international influences, creating truly unique desserts while embracing some of the great classics.Upon her clients’ frequent request, in 2014 Claire created a bold new menu: her “sugar sequence”. 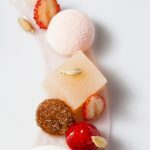 A new vision of patisserie, the menu comprised a complete meal dedicated to desserts, respecting the traditional format, using fruit and vegetables, and focusing above all on the natural sugars of her products without ever overloading the taste buds. A trailblazing idea in gourmet cooking, the menu was acclaimed by press and critics alike. From 2015 to 2018, she has been the Director of Creation for Ladurée.